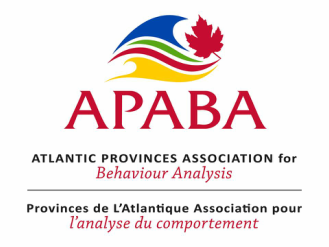 ​APABA is the Atlantic Chapter of the Association of Behaviour Analysis International and serves the provinces of New Brunswick, Newfoundland/Labrador, Nova Scotia and Prince Edward Island. Feel free to browse our website for further information or visit our Facebook page using the link below. Ask the Supervisor - At the request of our members, APABA has added this “Ask the Supervisor” section to our website. Members are able to access articles, resources, references, and suggestions from experienced supervisors related to BCBA, BCaBA, and RBT supervision. Members can enter their question on the 'ask the Supervisor' page (located under member services) or email their supervision-related questions to atlanticprovincesaba@gmail.com and experienced supervisors will respond. Questions and responses will be posted on the “Ask a Supervisor” section of the website for the benefit of all members who may have similar questions. New APABA Awards - The Awards Committee has created information packets for three APABA awards that have been established. It is hoped that the awards will recognize initiatives of members, help spread understanding of ABA among the public and encourage students to enter our field. Click here for a brief description of all three awards.